STREAMING LIVE FROM ASHKENAZ, BERKELEY, CA! 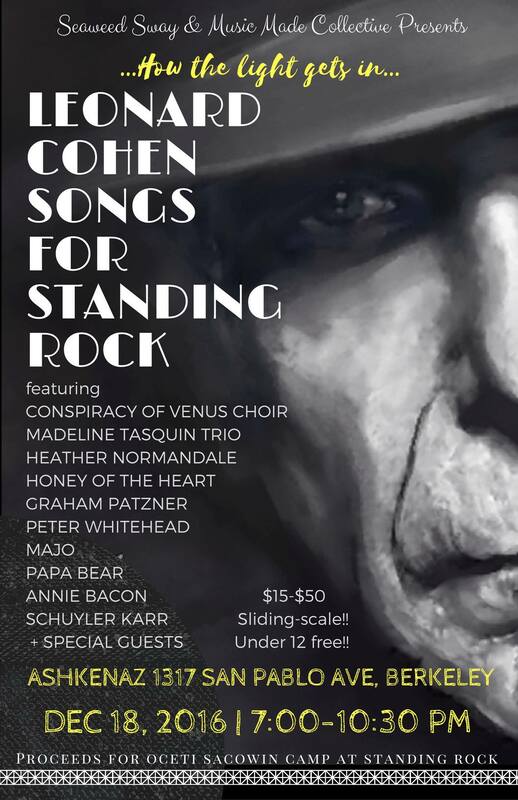 Honey of the Heat is honored to be among the fine musicians playing this benefit show for Standing Rock, Tribute for the recently passed and revered Leonard Cohen. …come together for a celebration of Leonard Cohen’s music and spirit, all in support of Oceti Sakowin Camp on the frontline of the #StandingRockresistance to the North Dakota Access Pipeline! For more info on the Oceti Sakowin Camp, please like and follow their page on Facebook, and visit http://www.ocetisakowincamp.org/ The #waterprotectors are entering a long & cold North Dakota winter, and money raised at this event will help them stay supplied through the winter. –follow the event and tune in between 7-7:30pm Pacific time on the day of the concert! All the musicians are donating their time for this event (thank you, gang!!) so that we can send 100% of the band’s door take at the event to Oceti Sakowin Camp. Ashkenaz will be calculating their expenses at the min. ticket price of $15, so rest assured all ticket sales above $15 min per ticket up to $50, will go directly to the fundraising goal of $5555. Please send this information to friends & family to help us reach our fundraising goal, and invite them to tune in with you on Sunday December 18 at 7:15 Pacific! Several of us performers have friends on the ground at Oceti Sakowin Camp, and we’re excited to bring our love of music and of Leonard Cohen’s work, while helping continue what has been a peaceful and love-centered resistance to this pipeline and, in spirit, oil & gas infrastructure expansion that threatens our precious waters the world over.